Not many in the world hit a major lottery jackpot in their lifetime. I remember when I hit the biggest jackpot in the world. It was the 9th of December 1949 when my feet first touched the sacred ground of Ellis Island. My brother, mother, father and I just disembarked from our transatlantic journey after leaving Germany weeks earlier (1). Being an American, becoming an American is the equivalent of a major jackpot in any other country. 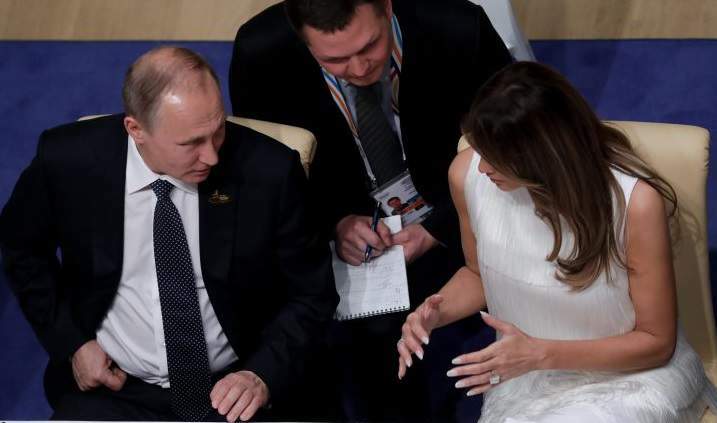 Take for example, the photo above where we see the American first lady (and first foreign born First Lady since 1825) and the Russian president sitting at dinner at the G20 Summit in Germany. There is an important lesson about jackpots behind the photo that many in our MSM will not report or comment on because it demonstrates why America is the greatest country in the world and as we know, the Fake News Media is the enemy of this country. Here is the backstory for the photo above. Melania Trump was born in 1970 in the then Socialist Republic of Slovenia during Slovenia's Years of Lead when her countrymen were economically exploited by Yugoslavia's Communist Regime. So what we have here is a female immigrant raised in a Communist Regime who came to America and became literally the most powerful female figure in the world who then sits and chats with the leader of the former Soviet Union. Now tell me that isn't the most inspiring image for millions of women still living under Communist subjugation. There are millions of stories in America. This is one of them. Muslims and the Diversity Jihad - Theme: Assimilate or go back where you came from. Mr President - Theme: Learn English or Get Out!